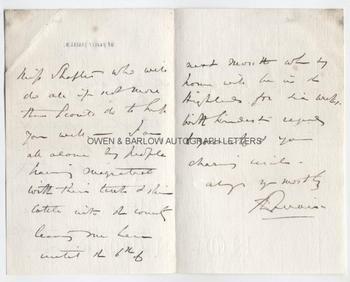 SIR RICHARD QUAIN Autograph Letter Signed. Irish physician. Author of Quain's Dictionary of Medicine. ALS. 3pp. 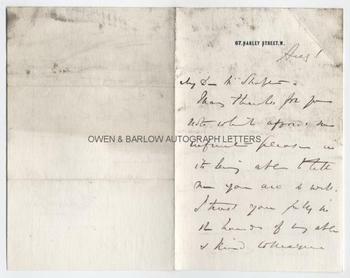 67 Harley Street, W. August 1st, no year [paper watermarked 1875]. To [Thomas] Shapter. 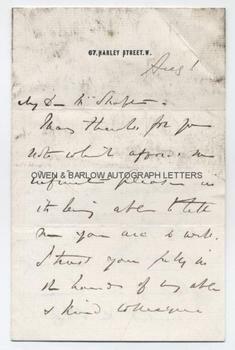 "Many thanks for your note which affords me infinite pleasure in its being able to tell me you are so well. I trust you fully in the hands of my able and kind colleague Miss Shapter - who will do all if not more than I could do to make you well. I am all alone, my people having migrated with their tents and their cattle into the country, leaving me here until the 6th of next month when my home will be in the Highlands for six weeks. With kindest regards to you all and your charming wife. Always yours most truly, R. Quain." 8vo. Approx 7 x 4.5 inches. A little dust-soiled. Very good. Sir Richard Quain was a Fellow of the Royal College of Surgeons and the founder and president of the Pathological Society. His best known work was in the field of heart disease, particularly the degeneration of muscle fibre by fat. He is now most famous as the author of Quain's Dictionary of Medicine, which became the indispensable medical "bible" for all British medical practitioners. It was Richard Quain who treated Benjamin Disraeli during his last illness, at the request of Queen Victoria. The reputation of Richard Quain as a physician was due not only to the sound common-sense which he used in diagnosis, but also to his good-humoured geniality which he showed to patients and friends. This is ably demonstrated in this letter to fellow doctor, Thomas Shapter, who he had evidently treated and left in the care of his daughter, Miss Shapter. Thomas Shapter (1808-1902) was a physician who was known for his early research into epidemiology and his book on the cholera outbreak in Exeter. The letter is from a 19th century collection formed by Miss Shapter.